Ever been in a situation where your car is caught in mud and you can’t break free? The wheels keep spinning round, you’re using a lot of engine power and yet you’re going nowhere fast. We sometimes get caught in a similar pattern in our work. We can be a hive of industry, being busy with tasks like marketing, but our results show nothing for them. It can feel frustrating. This situation reminds me of a tale from Hindu mythology that is rich in meaning. Here’s the version I grew up with. One day the God of Wealth, Kubera, decided to throw a sumptuous feast to show how much he owned. He invited the gods, Shiva and Parvati. They sent their son, Ganesh the elephant-headed one, as their representative. Ganesh was only a child at the time, so might not be expected to eat much. Kubera went to considerable effort over the feast. He wanted to show-off his wealth. He put his chefs to task to serve huge platters of food that would feed the hundreds of people invited. Ganesh arrived and as the guest of honour started eating first. He ate and he ate. There was no stopping him. As soon as one large platter of food was consumed, he was asking for the next. He ate all the rich sweets made days in advance, and all the other tasty dishes created. Yet he continued to be hungry. 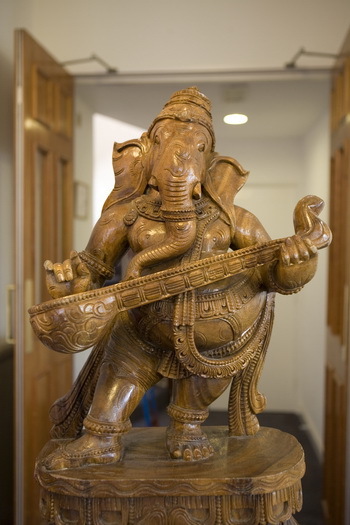 After a while all the food for the feast ran out – no one else had eaten apart from Ganesh. The elephant-headed deity turned to eating the pots and pans, and furniture. It was as if he had not eaten in months. He turned to Kubera’s gold and down it went. Still Ganesh’s hunger was unappeased. He then turned to Kubera with eyes as if to eat the man himself (a bit curious for a vegetarian God!). Kubera fled to Mount Kailash where the parents of Ganesh lived. He begged for help. The Divine Mother, Parvati, offered one spoon of her rice pudding to Ganesh and his hunger was instantly appeased. Kubera was saved and humbled. Hindus point to the humility of Parvati’s offering as being the saving grace. Kubera was full of arrogance at his power. He was taught a lesson in how to be more humble. For me, there’s another meaning. Only the Divine Mother's love is enough to ease a person’s inner hunger. Kubera could have continued endlessly with empty action and got nowhere in satiating Ganesh’s appetite. How many business people go around with a sense that there’s not enough? Not enough clients, not enough work because of the economy, and forever feeling chased by the clock? They seem caught in a cycle of not enough and have to run just to stand still. In contrast, what about the business person who makes space for some inner work? They might meditate or use tools like EFT to help them find a place of mental and emotional balance. They feed their inner worth so that they radiate natural confidence. They seem to achieve more with less work. I took time away from writing for my website over the last few months to enjoy my wedding plans. On the day we were blessed with gorgeous weather from dawn til late - unusual for an English summer. Our guests kept saying how rich in meaning and fun our Hindu ceremony was, and how there was so much to keep them entertained all day and evening. We had an incredibly happy time. I took very little action in marketing my business in the run up as I had limited time. But I continued to work full time with clients. The month before my wedding was my busiest one financially this year. I listened to what made me feel happy. As a result clients connected with a confident and relaxed coach whom they absolutely wanted to work with. Healthy in Mind viewpoint: ease the fears about not enough on the inside, and you’ll find the outside showing up with plenty.